Encelia resinifera variety resinosa. Synonym: Encelia frutescens. (Sticky Brittlebush). Semi-desert. Openings. Spring and summer. Above: Hidden Valley Trail, Utah, October 21, 2013&. 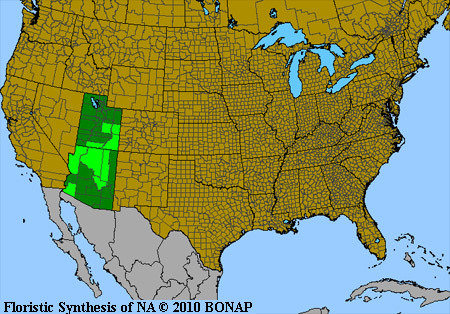 Left: Butler Wash, Utah, August 27, 2007. 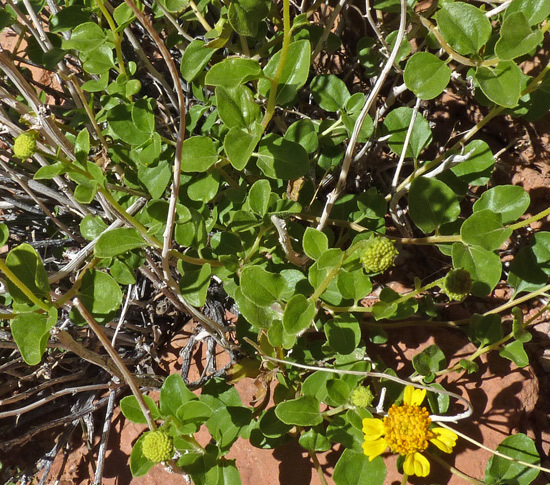 This handsome shrub grows in rocky, sandy areas to four feet high and wide with rough, shiny, spade-shaped to nearly round leaves and numerous lemon-yellow flowers. Encelia resinifera flowers from late spring through the summer and even into the fall, depending on moisture and warmth. 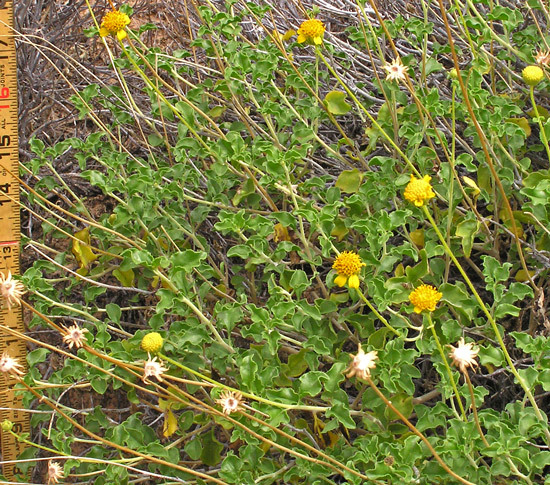 The Flora of North America and the Synthesis now indicate that Encelia frutescens is a species of Arizona, southern California, and southern Nevada. 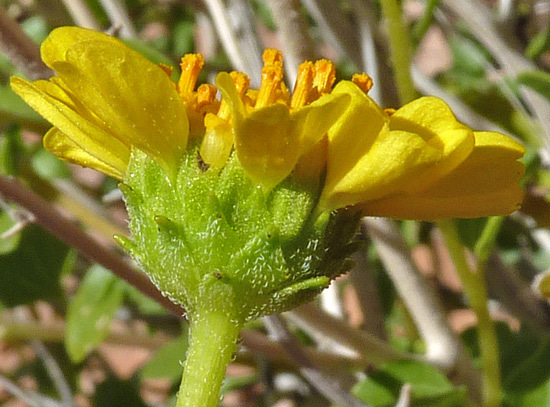 Encelia resinifera is found in southern Utah and Arizona. 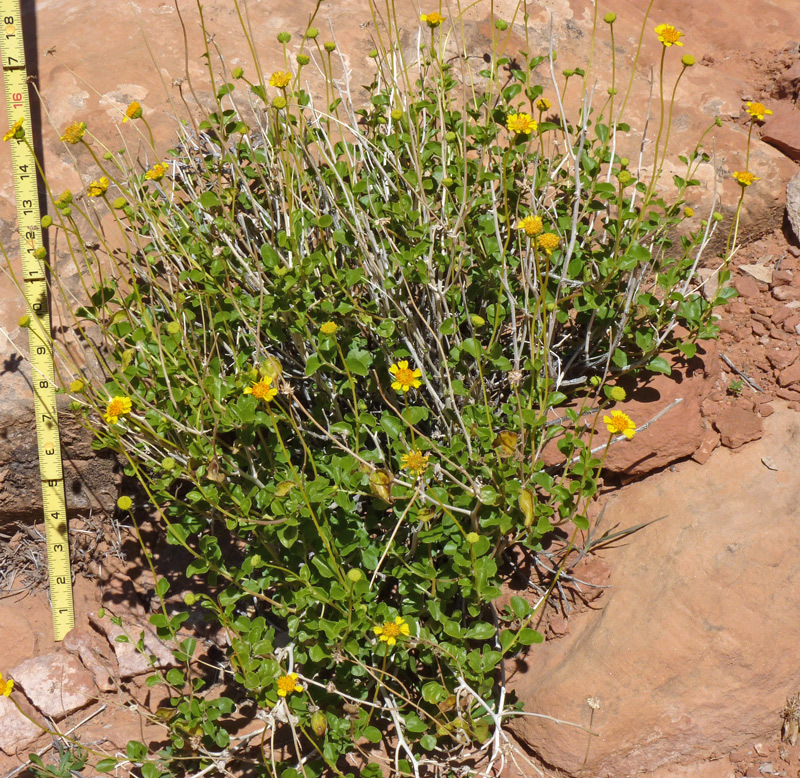 This plant was first named Encelia resinosa by Brandegee in 1907 and renamed E. resinifera by Clark in 1998. Hidden Valley Trail, Utah, October 21, 2013. 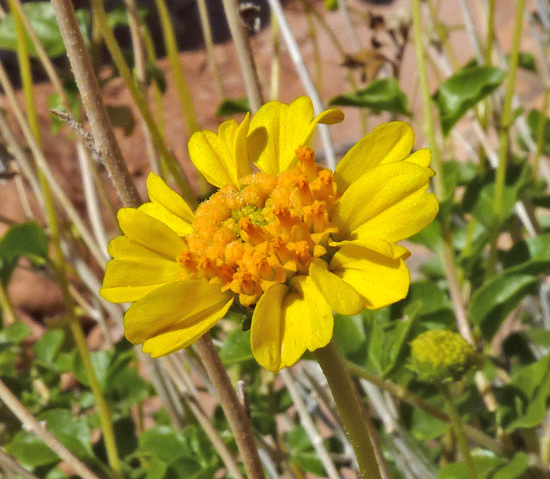 Flowerheads are single at the end of long stems; ray flowers are usually present in our area; corollas are orange-yellow; phyllaries are short-hairy, in 3 or 4 overlapping series, and broadly lance-shaped. Hidden Valley Trail, Utah, Utah, October 21, 2013 and Lower Butler Wash, Utah, August 27, 2007. Leaves are thick and green and appear to be smooth until one takes a closer look and then the usually present glandular, pustulate-based hairs become apparent. 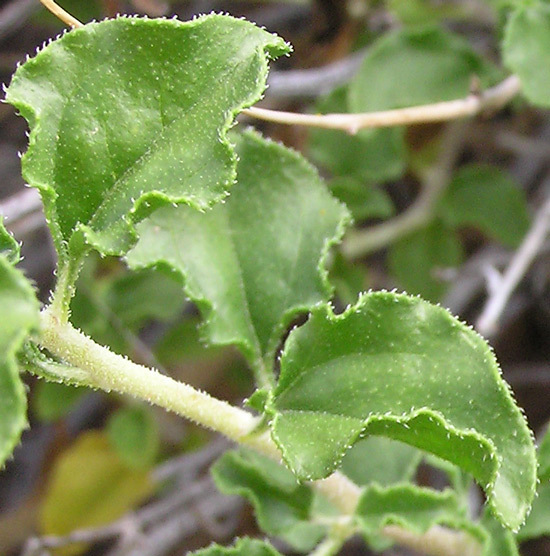 Leaves can also have short, stiff hairs. In all of the photographs on this page, notice the white stems, remnants of the previous year's growth.